Hong, Sung Taek (2013). 5 Poles. Seoul,Korea: dreamN. ISBN 978-89-88349-41-0. This is the genuine adventure of real men! Surprisingly, there has been many explorers went on a polar expedition, but not many of them recorded their journey in detail. Finishing an exhausting day, keeping a detailed daily journal would be a taxing task for them. However, explorer captain Hong Sung-Taek recorded his daily experience vividly. His journal records the truth our human race is faced with global warning, the situation of the polar region that is only known to the explorers themselves, such as the glaciers swept away to the Pacific, rivers forming in Greenland from melted glaciers, the dark surface of ocean revealing itself after few million years old of glaciers melted away. The worries about global warming is not new to us, but reporting on what is really happening and witnessing them with bare eyes is something that has never done in human history. It was a duty of the explorers to check the site on behalf of the scholars and researchers whom are not able to be there in person. The story of overcoming the unthinkable hardships that one explorer could face during the expedition, his blood and sweat, the flaming passion to step toward the goal is vividly revealed in this book. With the progress of civilization, we are in the time where we can travel the world as well as the space. However, the dazzling modern civilization does not reflect the value of that era. Until now, there are mysteries in many parts of the world that cannot be solved by human logic and still beyond the reach of human contact. Despite the invention of a plane that can fly across the continents in few hours, explorers are those who walks that unpaved road on their foot in the hope of getting closer to the answer for those unsolved mysteries. No matter how much the civilization evolved, what can be more certain than the facts they have discovered? What is more valuable than the footsteps they have left on the road by testing their limit? Captain Hong Sung-Taek is also someone who always choose to go forward without any doubts. He is someone who never stops until he touches the limit. With his unique philosophy, he never rests his journey to the pole. He always says he would risk everything he owns for the expedition and just like that, he went for the expedition on his own, unsupported. And this book is about the story of his tears and laughter on his expedition which he went on after giving up his wealth and privilege. It is a story of a humble man who stepped into a journey to the end of the earth with nothing but only with the ambition to explore more. Chapter 1. The Last Footstep, Bering Sea | The 1st chapter is about the story of the world first successful on-foot expedition to cross the Bering Strait, the distance of almost 90 km from Chukotka Peninsula, Russia to Nome, Alaska. Captain Park Yeong-Seok in his living years, promised Captain Hong Sung-Taek to go on a Bering Strait expedition which he failed once. But he never came back from Mt. Annapurna and could not keep his promise. To honor the promise with Captain Park, Captain Hong Sung-Taek set off on the journey to Bering Strait. With global warming and melting glaciers, his team’s journey may have the left last footstep of human race on the Mongolian route. And there were four men, who fought the piercing cold and darkness without a single drop of water for 20 hours. Chapter 2. The White Revelation, Greenland | 1. Greenland reconnaissance journal 2. Greenland, again 3. Greenland environment report | The 2nd chapter is about Greenland, the world’s greatest island where 80 percent of its land is covered with ice that is as thick as 3,000m. The members and Greenland pure breed dogs became one team and went on the long journey, crossing 2,600km on the glacier. The journey went on in tough condition. While crossing the Greenland the 3 expedition members survived the whole trip by sharing one instant noodle a day for one week. This tough journey has served as a momentum to reveal that the melted glacier turned to rivers. Chapter 3. From Dark Night to White Night, the North Pole | The 3rd chapter is about the journey with Captain Park Yeong-Suk in his living years to the Ultima Thule, the North Pole. Pulling a sled almost 100kg, 4 members silently walked more than 1,000km through the blizzard and white-out. After falling into bottomless leads and enduring the freezing pain, the members reached the North Pole. The late captain Park Yeong-Suk, owing to this expedition, recorded the mountain grand slam. Chapter 4. Land of Life and Death, Qomolangma | The 4th chapter is about the deadly expedition to the world’s highest mountain Qomolangma, where 2 members lost parts of their body and the other two Sherpas lost their lives. Avalanche happens in an instant, Strong winds that seem to blow their body away, crevasses hiding everywhere and many other dangers never put the members at ease. The courage of members to continue on the journey truly questions the limitation of human faculty. This is the story I would like to tell every mountaineer out there who is heading for the Himalaya. Chapter 5. Land with White Winds, the South Pole | The 5th chapter reveals the hell-like face of the South pole. 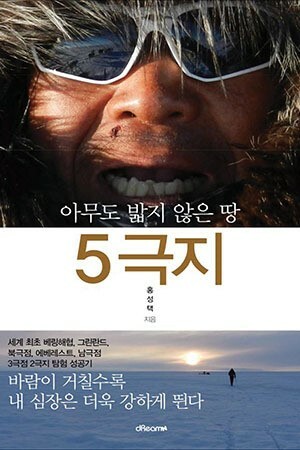 The team’s journey from the base camp to the South pole, was the first success made as a Korean expedition team and the 4th success in the world. The journey took a total of 44 days and this remains as the world record of the shortest time spent on the South pole expedition. The expedition team was led by captain Heo Yeong-Ho, a strong leader who encouraged the members with an unbending spirit, and his team whom navigated their way to the South pole despite all the hardships. White Apocalypse Greenland is a message of the fierce life survival, and also a warning to the changing global environment. In 1994, he skied to the South Pole with Captain Heo, Young-Ho, and, in 2005, he reached to the North Pole with Park, Yeong-Seok . It is a very rare experience in exploring.